This is a luscious dessert that’s easy to make. 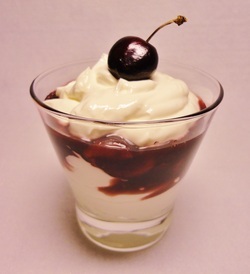 The sweet sauce layered between the slightly tangy quark has cherries with different textures: some are cooked, others not. This makes the sauce more interesting – and the whole dessert utterly irresistible! 1. Start by making the cherry sauce: take half of the cherries, cut them into quarters and put them into a saucepan. 2. Add the cherry juice and Sweet Freedom. 3. Mix the corn flour and water in a little glass and set aside for the time being. 4. Bring the saucepan to the boil on a gentle heat. Stir every now and then with a whisk. When the liquid starts bubbling, mix the corn flour and water in the glass so that it becomes smooth. Then slowly pour it into the saucepan, whisking all the time. Simmer for about a minute so that the sauce thickens. 5. Take the saucepan off the heat and put it somewhere cool. 6. Take the rest of the cherries, apart from 4 cherries which will be used for decoration. Cut them into quarters. Mix them into the sauce. Keep the sauce in a cool place while you prepare the quark. 7. Mix the quark, lemon juice and Sweet Freedom in a bowl. 8. Take another bowl and whisk the cream until it starts to thicken but it’s still a little sloppy. 9. Stir the cream into the quark. 10. Spoon just over half of the quark mixture into 4 serving glasses. Spoon the cherry sauce on top. Add the rest of the quark mixture over the sauce. Decorate the desserts with the 4 cherries. Chill in a refrigerator for at least ½ h before serving. If you’d like to make this dessert without corn, use potato flour (starch) instead of corn flour (starch). If you’d like to make it lighter, leave the cream out and use a little more quark.